Our dear Missy has begun her final journey North of the Rainbow Bridge. In the past couple of weeks, Missy had been slowing down and it had become harder for her to get around. While her foster family did all that they could to keep her comfortable, she was clearly in pain. Surrounded by love and showered with tears, Missy passed peacefully. 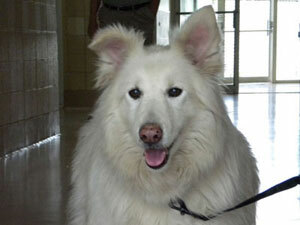 Missy is thought to be a Siberian/Golden/Collie mix that has been part of the MaPaw family for eight months now. Actually, we aren’t sure of Missy’s exact breed make-up, we just know she is a wonderful, loving girl that needed a little help from her friends. Missy is close to fifteen now and time has taken its toll on our sweetheart. Apparently she had a bit of a rough life in the past – her tail was previously broken in two places and her ear appears to have been injured or suffered from an untreated infection. Missy has settled into her foster home where she feels safe and loved. As time goes by she is requiring more care and devotion. Her rear legs are starting to give out on her and she is assisted with a sling at times until she regains her confidence. She is on several daily supplements for her joints and dry skin and is prone to ear infections… Getting old is not easy, but she takes it in stride knowing she is loved. This brave girl is more than welcome to stay in her MaPaw home ~ receiving the love and respect she deserves.